Monday September 6th 1920 Labor Day and Rob had some time away from the store. Lorie went to the Dr in afternoon. Later the rest of us rode to Wellman and back. A perfectly beautiful day. 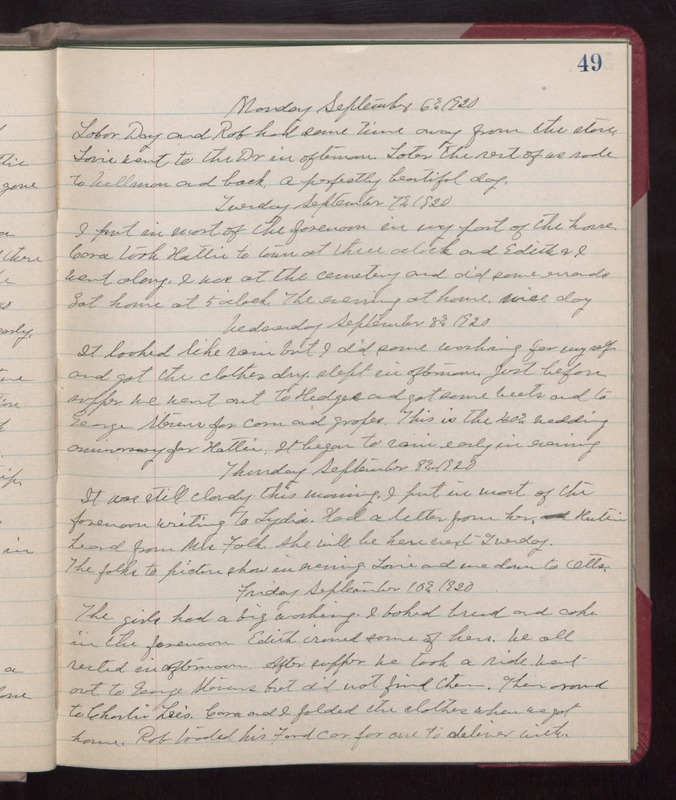 Tuesday September 7th 1920 I put in most of the forenoon in my part of the house. Cora took Hattie to town at three oclock and Edith & I went along. I was at the cemetery and did some errands. got home at 5 oclock. The evening at home. nice day. Wednesday September 8th 1920 It looked like rain but I did some washing for myself and got the clothes dry. slept in afternoon. Just before supper we went out to Hedges and got some beets and to George Stevens for corn and grapes. This is the 40th wedding anniversary for Hattie. It began to rain early in evening. Thursday September 9th 1920 It was still cloudy this morning. I out in most of the forenoon writing to Lydia. Had a letter from her. Hattie hear from Mrs Falk. She will be here next Tuesday. The folks to picture show in evening. Lorie and me down to Otts. Friday September 10th 1920 The girls had a big washing. I baked bread and cake in the forenoon. Edith ironed some of hers. We all rested in afternoon. After supper we took a ride. Went out to George Stevens but did not find them. Then around to Charlie Lees. Cora and I folded the clothes when we got home. Rob traded his Ford car for one to deliver with.